The new model home, The Moonsgate, is expected to be complete in January and will include three bedrooms, two full baths and owner’s retreat on the main level. In addition, the floor plan will feature an open kitchen with large island, dining room, fireplace in the family room, second level retreat and basement. Homes in The Reserve at Barrington will range in size from 2,400 to 3,200 square feet with homebuyers choosing from five floor plans with owner’s retreat upstairs or downstairs options. Barrington residents enjoy nearby specialty shopping and dining at Village Center, open spaces and wetlands, proximity to parks and Metra Station, with access to Chicago. Students attend Barrington District 220 schools. 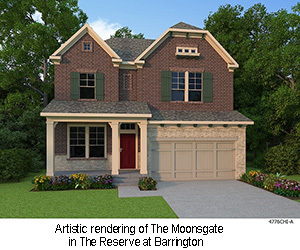 To learn more about The Reserve at Barrington, call 800-403-2783.